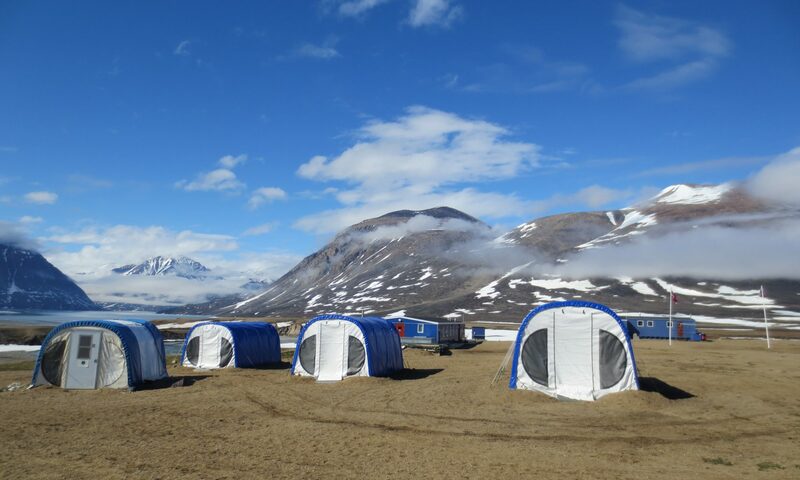 The University of Leeds has returned to the Finse Alpine Research Station, Norway. We are met by wetter, colder and windier conditions than during our July stay, and persistent mist and fog has joined us. Autumn has arrived here and during patches of improved visibility, the mosses and dwarf shrubs are a show of colour. We set out across the plateau to visit our 15 river sites and retrieve the cotton strips which have been submerged for the past six weeks, to measure cellulose decomposition. Good news – they have all survived!! Despite potential flood events, high turbidity and movement of bed substrates, our cotton strips have persisted at all sites – incredible! This is a huge relief as it provides us with data across a gradient of glacial influence. A small portion of each was removed and preserved for microbial analysis. The remaining strips were placed in ethanol to halt any further decomposition on transit back to Leeds. Here there tensile strength will be determined as a proxy for cellulose decomposition. We hope to identify the response of river cellulose decomposition to glacier retreat. During this stay, we have also re-run the incubation experiments performed in July to measure benthic respiration rates across a glaciality gradient. We have repeated this for 12 sites and although data is very preliminary at this stage, rates appear to be slower than in July, potentially indicating a seasonal influence upon cobble respiration. Biofilm scrubs will be taken and the surface area of each cobble calculated to determine benthic respiration rates in response to deglaciation. Collection of cobbles and stream water from across the plateau gave us opportunity to see some of the spectacular wildlife at Finse. We would like to thank Interact, the station and particularly Erika Leslie, for making us so welcome in Finse. We have been incredibly lucky to get our samples and have really enjoyed our time here. We are entering the last few days of our first trip to Finse. We have been really lucky with the weather and have managed to collect benthic cobbles from 14 rivers, for incubation in our respiration experiment. On returning to Finse in September, we will re-run this process, to detect any seasonal variation within benthic respiration rates along our glacial gradient. We will also be on the look out for our cotton strip assays, deployed to measure cellulose decomposition. They will be left within the rivers until we return and fingers crossed, can find them again. Our hope is that the rivers will not have washed them away in flood or left them exposed during periods of low flow (quite picky). We need a viable sample to have been submerged throughout to represent in-stream decomposition. Thanks to INTERACT funding, our focus over the past week at Finse has been to study how river ecosystem functioning alters along a gradient of glacial influence. To find out more about our work, and that of our research cluster, please visit our website (http://www.geog.leeds.ac.uk/research/river-basin-processes-and-management/) and the water@leeds pages (http://water.leeds.ac.uk/). You can also keep up with us on Twitter (@rbpmleeds, @SoGLeeds, @LeedsYorkDTP, @scfell1). We thank the Finse Alpine Research Station for making us welcome. See you in September! 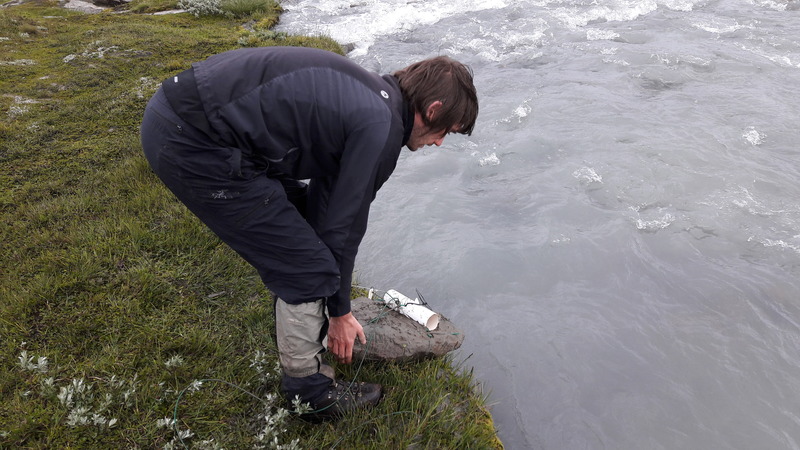 Over the past few days at Finse Alpine Research Station, our University of Leeds Team have been collecting benthic cobbles and water from our 12 river sites, which span a gradient of glacial influence from 0-85%. Our aim (aside from weight training), is to determine how benthic respiration rates alter along this continuum. Back at the station, we have been incubating our samples in cylindrical plastic mesocosms, at a fixed temperature. Here our Piccolo2 probe (http://www.pyro-science.com/piccolo2-optical-oxygen-meter.html) is used to measure reductions in dissolved oxygen concentration. Following incubation, we began tin foil origami, carefully wrapping up each rock. A regression of foil weight was used to estimate active surface area. Then, it was back to those trusty toothbrushes, as a sub-sample of each rock was scrubbed and the biofilm collected and frozen. This will enable biofilm biomass estimates, following calculation of ash free dry mass, back in the lab at Leeds. Our next few days will be spent collecting further samples for incubation and attempting to be equally experimental with our remaining tins of chopped tomatoes. Our first full day in the field is spent walking a loop across the Hardangervidda plateau, visiting river sites between the station and Blåisen glacier. Our aim is to sample along a gradient of glacial influence and we selected our sites before arriving at Finse, using the percentage cover of ice within watersheds to create a space-for-time substitution for deglaciation. We are lucky with the weather and visit five sites. At each site, we sample the microbial communities of benthic river sediments and cobbles and adopt the age old (if not slightly eccentric) approach of scrubbing rocks with toothbrushes to detach biofilm samples. To draw further suspicious looks from passing hikers, we tie cotton strips to large rocks and place them onto the river bed. Alongside temperature loggers, these assays follow the Celldex Protocol (https://www.researchgate.net/publication/281243407_CELLDEX_Protocol_Part_1 ) and will be used to measure benthic decomposition rates along our gradient. They will be incubated here until we return to Finse in early September to retrieve them. Once back in Leeds, their tensile strength loss will be determined, as a proxy for cellulose decomposition. Every effort is made to secure the cotton strips, as they need to survive the high, turbid flows and potential bed movement. GPS points are taken to help re-locate them – fingers crossed! Days 2 and 3 are spent visiting a further seven sites, appreciating the beauty of the place, looking out for lemmings, questioning the nutritional value of cucumber and being grateful for the station drying room. This brings our total to 12 sites, spanning 0 – 85% glacial cover.